Arginaid® Powder is a drink mix that delivers 4.5 grams of L-arginine and Vitamins C and E for wound management. It only has 25 calories per 9.2 gram serving when mixed with water so it is suitable for those with diabetes or those who require a calorie restriction. 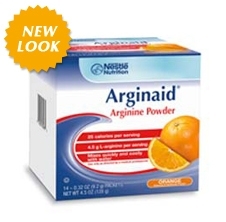 Arginaid® Powder is available in orange or cherry flavor. It will mix easily with water, fruit juices, yogurt, or applesauce. Appropriate for lactose-free, gluten-free, kosher, and sugar-free. Arginaid® Powder provides nutritional support for pressure ulcers, diabetic foot ulcers, venous ulcers, burn injuries, and non-healing surgical wounds. This is a medical food intended for use under medical supervision. It is not intended to diagnose, treat, cure, or prevent disease. * One 9.2 g serving provides 4.5g of L-arginine (1.4 g nitrogen). A single amino acid is not considered a protein. Oral: Mix contents of single-serving packet with 6-8 ounces of water, stir briskly, and consume. Tube Feeding: Mix one packet with 120-180 mL warm water. Mix and administer by syringe through feeding tube. Flush afterwards with a minimum of 1-2 fl oz (30-60 mL) water. Two servings per day are recommended. Servings may vary according to individual assessment by a qualified health care provider. I like this product. It works!